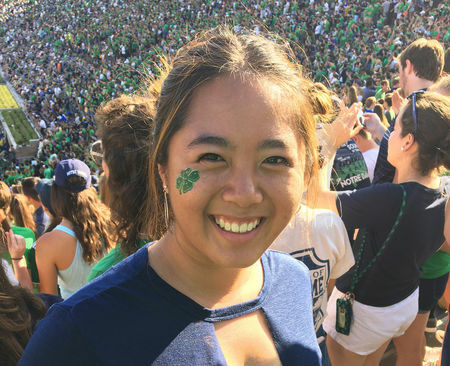 Physics major Nicole Lee is a Greater China Scholar and Hesburgh-Yusko Scholar. Originally from Malaysia, she grew up in Kuala Lumpur, Shanghai and Hong Kong. She intends on becoming a writer or journalist, using her platform to raise awareness on key issues around the globe to effect change. During her time at the University of Notre Dame, she plans to contribute stories to Notre Dame International, giving students around the world inspiring insight into the life of an international student. In this story, Lee reflects on experiencing her first American Football season. “The ball is always round.” That’s what my dad had always said to me growing up, and by that he meant anything can happen and to expect the unexpected. Now, this is true for pretty much every sport that requires the use of a ball, with the exception of rugby and American football. And yet despite American footballs not being round, clearly anything can still happen, and clearly everything that can happen, has happened too, with the Fighting Irish finishing the 2018-2019 regular season undefeated. Growing up, a football to me has always been that round ball with the black and white hexagonal patterns, otherwise known as a soccer ball on this side of the Atlantic. Nineteen years later, not much has changed. A football is still a football to me, the round, black and white one, – it is not a soccer ball – but in the past four months I have come to love, learn and appreciate a second kind of football, American football. Prior to coming to the United States and Notre Dame, all the knowledge I had of American football was picked up from watching movies like Rudy, The Blind Side and We Are Marshall. American football to me was just a bunch of sweaty guys in thick pads tackling each other; in other words, my knowledge of the game started at quarterback and ended at Tom Brady. For all I knew, an NFL Player, even one of our own ND football players, like Ian Book, Brandon Wimbush or Drue Tranquill could have walked right past me and I would have been none the wiser. It goes without saying, in the months since, I have learned a lot at Notre Dame, about faith, physics, philosophy and even football too! I now know what the four downs are, the difference between a kick and a punt, a sack and a tackle, and when we should run the ball as opposed to when we should be passing it. I’m not an expert by any means, but those hours spent grilling my fellow football-crazy freshman have certainly amounted to something. Not to mention, I can now name at least ten of our players and even recognize a couple more of them, without even having to check their bag tags. If I had to pick a highlight from our entire undefeated season, it would, without a doubt, be the Stanford game, when the then 8th -ranked Irish beat the 7th -ranked Cardinals 38-17. That game just stood out to me not just because it was against one of our huge rivals, but because of the electrifying atmosphere in the house that Rockne built. 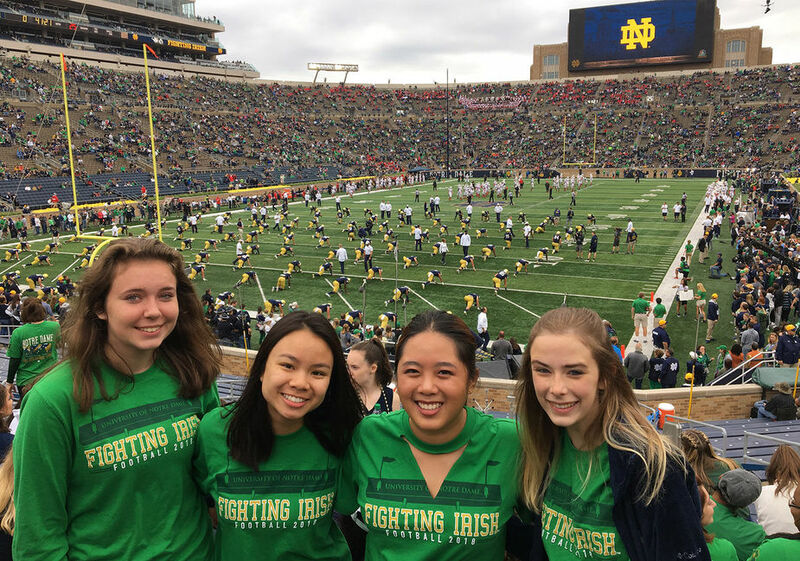 The Irish were on a roll, and the student section came alive, cheering and jeering late into the night under the floodlights of Notre Dame Stadium, with non-stop touchdown pushups, the Irish jig and of course, the alma mater at the end. It was certainly a night to remember! Though my feet were aching at the end of those 4.5 hours and I had screamed myself hoarse, I loved each and every second of it. For me, this was the moment when everything clicked, when I no longer felt like a single student amongst a sea of many other students, but when we felt like one – and that’s the power of football, it brings people together and turns them into family. The unity, the tradition, our rich culture, community and spirit – this was exactly why I wanted to come to the University of Notre Dame, and it more than delivered. It impressed! Originally published by Nicole Lee at issa.nd.edu on January 31, 2019.